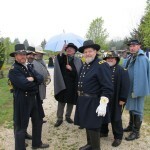 The weekend of April 8-10th Clover Hill Village, Appomatox, VA had the first installment of a special series of events titled “The Long Road Home” which will follow Civil War soldiers on the final campaign leading up to a major reenactment of the 150th Appomatox. 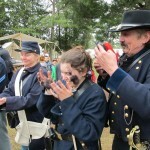 The event this year- Cold Harbor which had those critical of the war labeling Gen. U. S. Grant “The Butcher”. 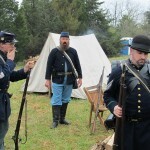 As promised – the first of this series was unlike any event presented so far in that reenactors and living historians worked together to make the experience as real as possible for the public. And unlike any other event the spectators found themselves stepping beyond the yellow tape barrier in an interactive experience with them able to volunteer to help soldiers write home, help medical personnel with difficult patients in a fully set up field hospital and talk directly to the commanding generals. 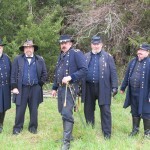 Sponsors are the Appomatox County Historical Society, United Daughters of the Confederacy Appomatox Chapter 11, and the prestigious living history groups Leeâ€™s Lieutenants and the Federal Generals Corps. 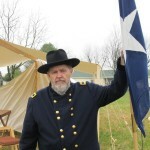 Rick Byrd and I left on Thurs to arrive early to start setting up camp in the area designated for the Federal Generals Corps and the Union troops. It was a beautiful day, though scattered thunder showers and cold nights plagued the event until Sunday just before period church services in both camps that were open to the public. Still, no one was about to let wet weather and cold nights get our spirits down. Many of us had to change the personnas we usually portrayed. 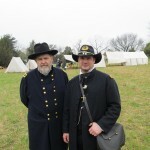 Rickâ€™s character for the weekend was Maj. Gen. William F. Smith, commander of the 18th Corps and mine was Maj. Gen. Phil Sheridan. This of course put us in research mode before the event so we could properly portray our personnas for the public. 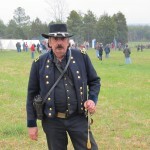 I had to put up with a lot of ribbing from my friends in Leeâ€™s Lieutenants like “Keep matches away from him.” and got into a bit of a debate on tactics with Gen. Longstreet on “total war” in the Shenandoah Valley that the public enjoyed. 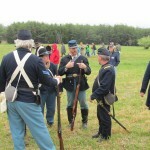 In our camp the public also got to witness Gen. Smith complaining about the decimation of his troops to Gen. Grant (Barry Meadows) and Gen. Sheridan arguing with Gen. Meade (Paul Bourget who usually portrays Gen. Green and supplied the photos of this event) over the proper use of cavalry among other scenarios. There were other changes, too. Because we lacked enough of a showing for Union troops many of the rebels had to “galvanize” and some of the generals went out as privates. And because of this lack of Union troops one of the funniest and most heart warming stories from the whole weekend came about. 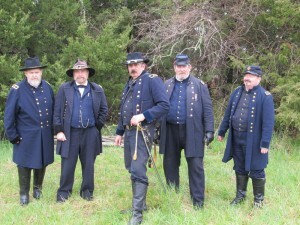 For the first part of Cold Harbor presented on Saturday, Jay Vogle who normally portrays Gen. Longstreet for Leeâ€™s Lieutenants became a Union private christened Pvt. Shortroad by everyone. Two two hundred foot trenches were ready for the battle reenactment though a bit soggy from showers and rail fences were set up to be taken down during the battle to add to the trenches. Confederate artillery fired to open the battle. 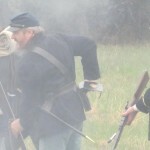 During the battlethat ebbed and flowed between the trench lines, Jay was a casualty near the Confederate trench. When the public was allowed to go out on the field to get the wounded back to the field hospital, Jay who lay unmoving was surrounded by aboutÂ a dozenÂ kids that ranged from kindergarden to third grade. Now Jay has to be over six feet tall. The action that followed reminded me of a bunch of ants trying to carry off a grasshopper. The kids surrounded him grabbing legs, arms, canteen strap and worked it out to drag him yelling, “One … Two … Three… Heave!” He remained limp through the whole thing, eyes closed yet alert to what they were doing with the canteen strap around his neck. The kids had dragged him about a hundred feet toward the hospital leaving a rut in the field before our nurse came to his rescue. Much to their disappointment, she pronounced Jay dead. OneÂ third grade boy protested, “But I took his pulse and he was alive.” Another boy about the same age chimed in, “We went through all that trouble dragging him over hear and now you say heâ€™s dead. Man!” They went off to the hospital to help others. Jay got up once they were occupied, his back coated with dirt. He was quite impressed by their team work and enthusiasm as we all were. Saturday evening Clover Hill had a meal of pulled pork with all the fixings for all the living historians and reenactors. We had to rush through supper as a thunder storm was on the way. It kept both the talent show and night firing from going on, which was unfortunate. All in all we had a great time educating the public and though we had more living historians than reenactors on both sides, it was considered a successful event with a good public turnout and we all hope more reenactors will show next year in April for the Battle of Five Forks in the Long Road Home series.